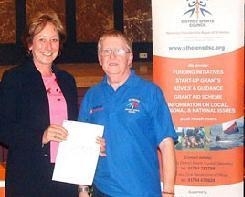 Rainford Tennis Club have received a sports grant from St Helens District Sports Council. The Club have received a grant of £337.50, which will be used towards the cost of purchasing and errecting a road sign on Church Road directing people to the Club. Our picture show St Helens District Sports Council Chairman, Roy Jones, presenting a cheque to Helen Bligh, Chairperson of Rainford Tennis Club.